The Malvern Collegiate community got a late Christmas present recently. 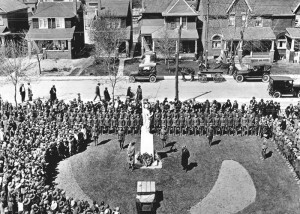 Last week Toronto District School Board (TDSB) Archivist Greg McKinnon received a phone call directly from Jean-Pierre Blackburn, Minister of Veterans Affairs and Minister of State, to inform the board that the federal government had approved a grant for $14,000 for the restoration of the Malvern cenotaph. With the $30,000 already raised by donations from the community and an additional $8,000 the TDSB will spend to make the base of the statue safe and secure, the Onward Malvern Foundation has reached its goal of $50,000 needed to restore this important monument. School Trustee Sheila Cary-Meagher said that the success of the fundraising campaign was due largely to the volunteers who worked tirelessly to raise money and awareness. Vandra Masemann, chair of the Malvern War Memorial Restoration Committee said that the committee is “very grateful to the Beach community.” She noted that almost 100 alumni, parents, students and community members contributed to the fund. She especially wanted to thank Dan Coldwell of PACE Credit Union for a donation of $10,000 and Maintenance, Construction, and Skilled Trades Council which voted to give the fund $9,000. The families of William Cummins and Wilfred Jones (both listed on the monument) were also important donors. And the power of the press also helped. After a series of Remembrance Day stories by national media outlets, Masemann said that the committee started to receive inquiries for as far away as Alberta. B.C. the Yukon and California. A group on Manitoulin Island which sponsored a local cenotaph also contributed. Work on the restoration will begin this spring as soon as weather permits. Hoarding will be erected around the statue and most of the work will be done in situ. The reconstruction of the arm and sword will be done in a workshop and added to the statue. Masemann said that plan is to have the restoration complete by Nov. 4, 2011 for an unveiling ceremony at 11 a.m. The committee hopes to recreate the photograph shown on page 1. While the goal for the restoration has been reached, the committee is still seeking donations to purchase lighting and a video camera to reduce the chances that the memorial will be vandalized or damaged again. Contributions can be made by sending a cheque directly to the school, 55 Malvern Ave. Toronto, ON M4E 3E4 or on the Canada Help website (www.canadahelp.org). The memorial is listed under Onward Malvern Foundation.